Vernon Volumes: Watching Mickey "Doo Way"
Connor likes to watch the Mickey Mouse Clubhouse on the Disney Channel, and recently likes to watch it in Mommy and Daddy's room. Sometimes he'll relax and get comfortable, the other day he was laying back with his hands behind his head and his legs crossed. It was so cute, but we laughed so hard about it that he got up and we didn't get a picture. 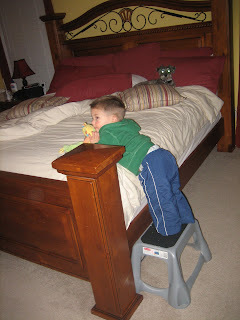 Mostly though, he likes to pull his step stool up next to the bed and lean onto the bed. It's his favorite way to watch his show for some reason. Doesn't look comfortable, but he likes it. Lastly, one of his favorite sayings is "Doo Way", which is used interchangeably for "This way", "That way", etc. If you ask him where he wants to watch Mickey Mouse (Downstairs, in the Living Room, or Upstairs in Mommy and Daddy's room), he usually will just point and say "Doo Way"!